Cilantro also called Coriander (Coriandrum sativum) is an annual herb in the family Apiaceae. 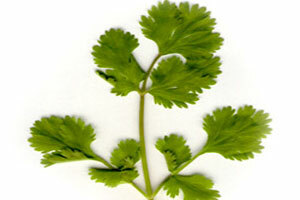 It is also known as Chinese parsley or, particularly in the Americas, cilantro. Coriander is native to southern Europe and North Africa to southwestern Asia. A researcher named Dr. Yoshiaki Omura discovered that some patients excreted more toxic metals after consuming a Chinese soup containing cilantro, the leafy part of coriander, an herb whose seed is a familiar culinary spice in African, Middle Eastern, and Indian cooking. In China, cilantro is called Chinese parsley, and it is used mainly as a garnish rather than seasoning. Cilantro is also common in some Italian dishes. It is a member of the carrot family and has a distinct taste that most people either love or hate. Coriander has been used as a folk medicine for the relief of anxiety and insomnia in Iranian folk medicine. Experiments in mice support its use as an anxiolytic. Coriander seeds are used in traditional Indian medicine as a diuretic by boiling equal amounts of coriander seeds and cumin seeds, then cooling and consuming the resulting liquid. In holistic and traditional medicine, it is used as a carminative and as a digestive aid. Coriander juice (mixed with turmeric powder or mint juice) is used as a treatment for acne, applied to the face in the manner of toner. Coriander can produce an allergic reaction in some people. People can eat cilantro, commonly used in soup or salads or to make pesto. For detoxification is is best juiced with a veggie mix that could include apples, carrot, cucumber, celery etc during a juice fast. I am recovering from mercury toxicity due to 11 mercury fillings, which were removed 10 months ago. Wondering whether you think juice and water fasting remove heavy metals from the body. The so-called mercury doctors say not to fast to eliminate mercury. However, out of desperation I did a nine day juice fast followed by a seven day water only fast. Had mostly good results, though some of my symptoms remain. Am planning to do more doctor supervised water fasting next month. Just curious what your thoughts are on the subject. (As far as whether water fasting and juice only can remove heavy metals). avamadalena: how did you find out you had mercury toxicity? did you have symptoms? For now I have opted to water-fast on the weekends and to precede each fast with a day of eating only fruits. Last weekend was my first weekend water-fast. On both last weekend and this weekend I drank coriander tea. I boiled two cups of tap water in a pan; turned off the heat; added two teaspoons of grounded coriander seeds; covered the pan and let it stand for about 20 minutes. Afterwards I slowly drank the tea. I did this because coriander has many healing properties (according to the information on many websites that I found googling). Is there anyone else using cilantro or coriander while fasting? If so please share your experiences. Fresh, cold pressed Aloe Vera juice, Ginger & Marshmellow root teas are excellent for the digestive system and promote both healing and detox. Parsley, Dill & Wheatgrass are also excellent! Thanks for that information Ron. I was wondering if taking a mild laxative would aid the detoxification process. I visited the local health food shop and asked the lady that I know there for something herbal. She explained that taking a laxative was not what I really was seeking but rather a detox product. The one she suggested is too pricy. I did some research on the internet and learned that there are a zillion detox products on the market, all claiming to be THE best, of course. I asked her about aloe vera juice but she didn’t seem to know much about it. For now I will stick with my coriander tea, and lemon with cayenne pepper in hot water. Usually in the morning, on an empty stomach I will mix a bit of cayenne pepper with curcumin in half a glass of water (I usually take it first thing upon rising from my bed). Hi mxxm, Senna tea is great for a “movement”. If you don’t need much coaxing like my wife, the lemon & hot water works fine. The detox process is inherent with fasting. Your body can do well on it’s own! Just a little nudging once in a while with the salt water flush (swf) & enemas is all you really need. One enema during a 3 day fast is fine. One-2 (if desired) “swf”, and 2-4 enemas during a 7 day fast. And you can do less if your fast progresses over 14 days. These are just guidelines. Everyone has different needs and results. I was never a big meat eater, or fast food junkie. My system didn’t have much sludge in the bowel area. But my liver and gall bladder were both in need of cleansing! And I also need to maintain them with periodic cleansing. I suggest ANYONE with digestive problems seriously look at “flushes” for these organs. You will feel like a new person! Fasting alone cannot cleanse them! At least not in 30-40 days. I could not believe what came out of mine with the flush! Thanks for that information Ron. I am new to fasting so there is much to learn. I am taking it slow, spending much time on the internet reading. Surprisingly there is a LOT of information to sort through. Your statement that my body can do well on its own has captured my attention. Isn’t that one of the principle foundations of fasting? Namely, that given the chance our body can cleanse itself and often heal itself. I am not saying that it needs NO help at all but only that it has inherent, very capable abilities, to cleanse and heal itself. So I am just going to slow down, take it easy and water-fast! Hi again mxxm, It really depends on how toxic we are. Water fasting is very good for detoxing thoroughly. Juice fasting is very good for healing. I think the key is to understand your body. You need a plan for your short term goal, and life goals. I never go long “without” fasting. And I know my body well enough to have an effective fast! I am NOT without fault, a know-it-all, or have all the answers. Even for myself! I am always learning, and asking our Lord for guidance. My downfall is certain foods, and beverages (beer) that I like, but are NOT good for my body. My body likes fresh, raw veggies and fruit. So it is a constant battle, and learning experience. I have a system that helps me. I fast one day per week, one week per month, and a month to 40 days at the Lenten season. It is a lifestyle, and spiritual experience for me. And the Lord has blessed me for it. So relax, and enjoy the fast that YOU create for yourself. The length of the fast doesn’t matter. It’s the quality of the fast! Meditate, and pray if you do. And you will be amazed at how “in-tune” you will be with your body, mind and spirit! We are here to guide, and answer questions. But, as you know everyone is different. So, as they say: “Your results may vary”.